Our customers had a point! While Tiller’s original budget spreadsheet boasted many powerful features, it lacked tools to track— and reward!— savings when customers came out ahead of plan. 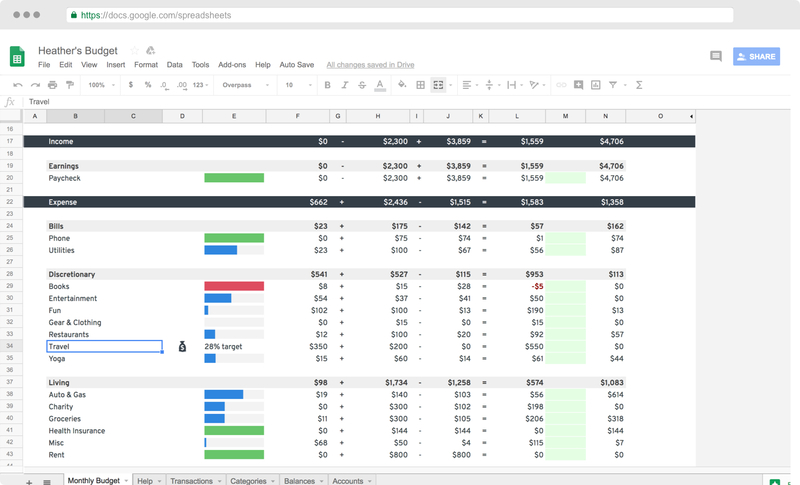 In November, CEO Peter Polson asked me to build tools to help customers better manage their finances in a spreadsheet with Tiller. We started work with a solution to help users planfully pay down personal debt. 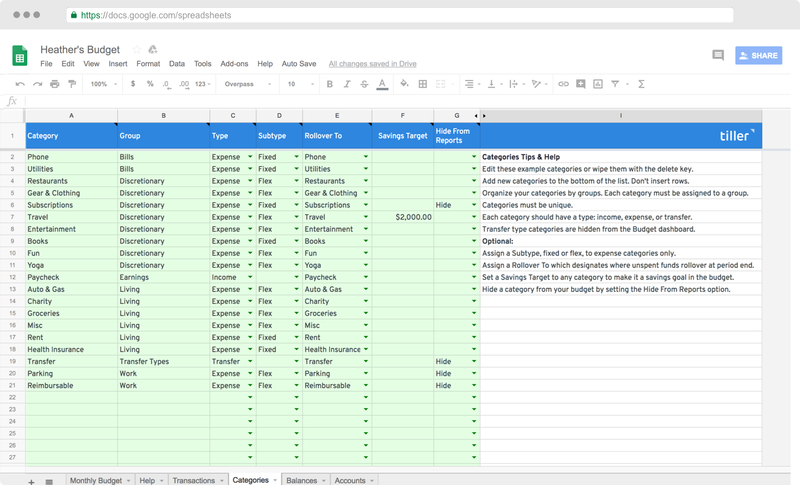 But, as we worked, we watched feature requests stack up for Tiller’s most popular spreadsheet template— budgeting. How hard could accruing savings in a budget be? I wondered. Since their invention in the late 1970’s, spreadsheets have been the go-to tool for managing finances. With intuitive workflows to organize, analyze, and visualize in real time, spreadsheets have an unparalleled ability to personalize data to a user’s unique needs. Yet most personal-budget spreadsheets realize precious little of this product magic. Once we released the Debt Snowball Spreadsheet, our team reviewed customer-support requests for Tiller’s existing budget solution and researched envelope- and zero-budgeting best practices. With envelope budgeting, we were inspired by the power of carrying forward unspent budget. Each category could act as a virtual, micro-savings account. Unspent Coffee budget in May could be used in June, or transferred to another category where it might be needed more urgently. The envelope-budgeting approach normalizes the ebbs and flows of real-world spending. It provides a solution to the common user pain point of periodic expenses that recur over longer time frames. A biannual auto-insurance expense, for example, can be budgeted in monthly increments, that accrue until the bill is due. This approach can even be used over the course of a year long time frame (e.g. budgeting $100 each month for a holiday gift giving). Traditionally, “envelope budgeting” is interpreted very literally— budgeting by stowing cash in meatspace envelopes. The envelope-budgeting concept, however, becomes vastly more powerful when executed within spreadsheets, where savings plans, instant transfers between categories, and rich budgeting history can be brought to life to analyze the past and inform future decisions. Our team also drew inspiration from zero budgeting, whereby users dynamically distribute budget dollars as needed on a period-by-period basis. For example, an unexpected car repair could be mitigated by proactively tapping budget for “Eating Out” and “Entertainment” for a month. For our new Tiller budget, we built patent-pending keyboard-shortcuts to enable quick transfers between categories. Especially if you’re a zero-budgeter, we can’t wait to hear what you think! To accomplish these tasks, our tool needed a place to store budgets, rollovers, actuals, and a few other key values on a period-to-period and category-by-category basis. We created a new data store, a sheet we called “Budgets History”. Budgets History is the nerve center of the new Tiller dashboard. It’s a rich source of financial history, performance, and budget-logic that we expect our users will plumb into inventive new dashboards and metrics. With the Budgets History sheet’s robust log of expenses and decision making, we can provide quick and easy recall of past periods, which are automatically saved, for analysis directly within the budget dashboard. Finally, users had also asked about tracking towards long-term savings goals, like a Rainy Day fund. So, we implemented savings targets to allow users to track key categories— Summer Vacation, New Car, Remodel— beyond the current period… but we went one step further. The savings request inspired a new concept that allows users to specify target categories for their surpluses on a period-to-period basis. For example, an avid theater-goer with a substantial Entertainment budget could direct unused Entertainment budget to a New Bike budget category. Watching funds accrue in a critical savings category is a great motivator for financial discipline with a discretionary budget. Sometimes in product development, disparate feature requests, when considered holistically, combine to realize a solution greater than the sum of the parts. When such a sprint comes together, it feels exhilarating, magical. Ultimately, Budget 2.0 resolved 11 distinct epics from our budget feature-request backlog. 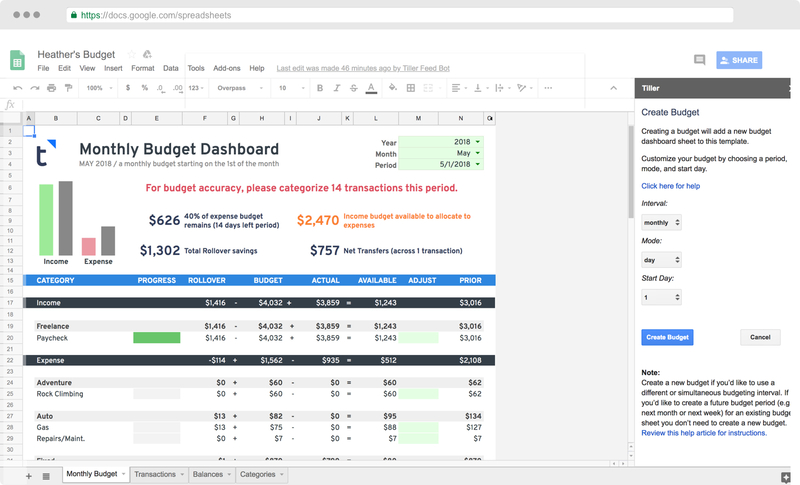 We hope you’ll agree that budgeting in a spreadsheet is now more powerful than ever. Budget 2.0 is inspired by your experiences and input. Let us know what you think, and if there are new features you’d like us to add.